Looking for a nutrient dense food that is high in fiber and provides you a smorgasbord of important nutrients like folate, vitamin E, vitamin B6, vitamin B5, vitamins C and K, magnesium, potassium, lutein, folate, carotenoids, iron and chlorophyll among others? Cultivated for thousands of years, avocados are originally native to Central American and were a favorite of the Aztecs. There are many different types of avocados ranging from pear shape to round and green to black in color. For the most part, two types of avocados grace the American table. California supplies Haas avocados (sometimes referred to as “alligator pear” because of their shape and texture) that are generally small in size, dark green in color and bumpy in texture before being peeled. They offer a smooth buttery, nutty type flavor and are rich in healthy monounsaturated oil. The West Indian avocado on the other hand, comes out of Florida…bigger in size and not nearly as bumpy before peeled and is lighter in color. The flavor of this avocado is not quite as nutty as the Haas variety, they are lower in oil and have 25 to 50% less fat than the more buttery Haas variety. Not only are avocado’s super nutritious, but they are versatile. You can use them on sandwiches, diced into a salad or mashed into a dip like guacamole. They can be put into omelets, chilled in soup or used in sushi. Many people enjoy them scooped right out of the peel. Plus, they are also perfect substitute for “butter, cream or eggs in many raw food recipes. When purchasing avocados look for firm fruit and allow it to ripen for a couple of days. Do not buy ripe avocados unless you plan on eating them the same day as they will continue to ripen. When your avocado is ready to be enjoyed, you will be able to squeeze it slightly…even though it is still firm. 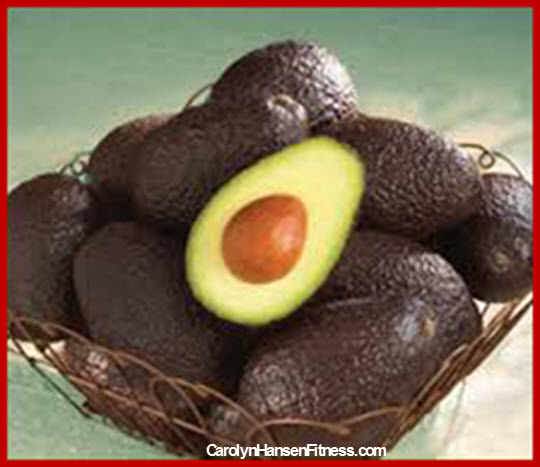 Avocados are low in saturated fat and the fats they do contain are healthy fats. In fact, 77% of the calories from avocados are from the fat. The majority of fat is oleic acid…a monounsaturated fatty acid believed to be responsible for some of the benefits they provide. Oleic acid is a “heart healthy” fatty acid that has been shown to have beneficial effects on genes linked to cancer and has been linked to reduced inflammation. Because the fats in avocados are fairly resistant to heat-induced oxidation making avocado oil a safe and healthy choice for cooking. Studies that examined the dietary habits and health of people who enjoy eating avocados have shown that those who did eat them are much healthier than people who don’t. Isn’t it time they became an important part of your diet?